Finding the right company to help relieve spiraling debt can be challenging. With so many services available and a wide variety of offerings, it can become a daunting process to identify a real solution that can check off all the necessary boxes. Even though companies provide several types of debt relief, selecting the best fit takes more than a simple search. With such a weighty decision, it is crucial to dig deep and truly understand what each provider offers, and how that can help reduce or even eliminate debt. What works for some may not work for others, and it is vital that customers feel comfortable with their debt relief company. There are some key components that customers should examine when making a decision, and they can help clarify which features are crucial, and which can be prioritized lower on the list. 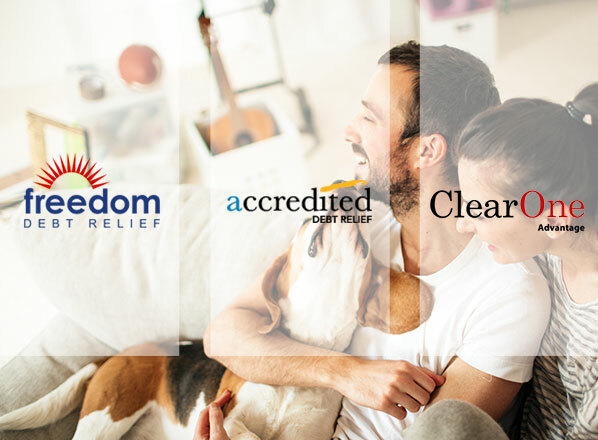 Today, we are examining three of the most well-known debt relief providers: Freedom Debt Relief, Accredited Debt Relief, and ClearOne Advantage. These companies have built a reputation on their success and their sterling track records. While they offer similar services, we are comparing them to see which one can fill the most needs. 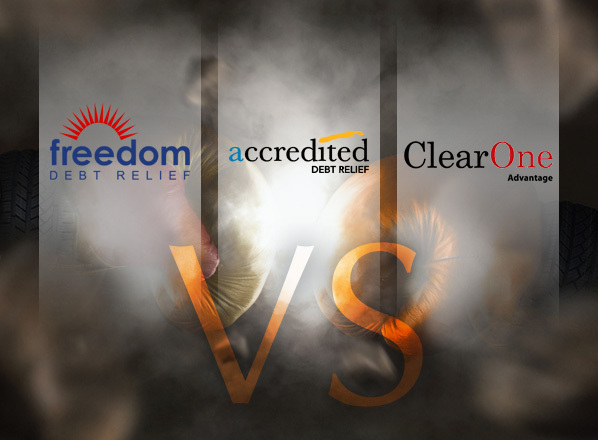 Read on to see who wins this battle royale of debt relief providers. Every customer has a unique debt situation. Be it a combination of credit card debt and student loans, or a large mortgage, each customer requires services that can fit their needs precisely. In this category, we found that all three competitors offer an excellent variety of debt types covered. All three companies focus on serving those customers with unsecured debt, but they work with several types of loans as well. As written in Accredited Debt Relief's review, the company works with a wide range of unsecured debt that includes credit cards, medical bills, collections and repossessions, student loans, IRS tax debt, and other unsecured debts such as personal loans. Overall, we were happy to see the inclusion of tax debt and medical loans, which are not covered by all debt consolidation companies. 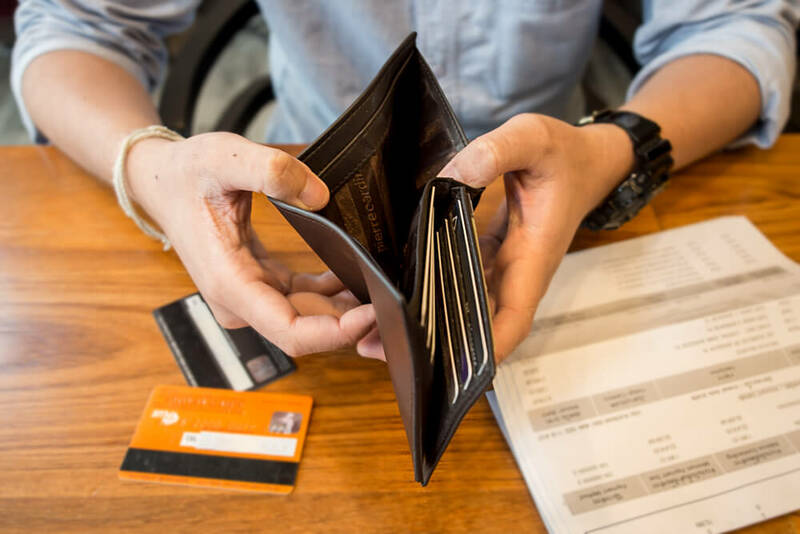 Freedom Debt Relief offers services for credit card debt, unsecured loans such as payday advances and personal loans, collections and repossessions, and medical bills. The company does not offer any services for secured debt. ClearOne Advantage aids customers with unsecured debt from credit cards and department store cards, personal loans, medical bills, accounts with collection agencies, payday loans, and federal credit union debts. WINNER: Accredited Debt Relief takes the first round with an excellent array of debt types covered, and especially for offering services that help with IRS tax collection, which the other two companies cannot deliver. One of the most important aspects of choosing a debt relief company is ensuring that they offer services that can meet a customer’s particular preferences or needs. While some may be happy with debt consolidation loans, others may be in a position where taking an additional loan is not an optimal solution. Offering a variety of services can empower customers to discover the best solution for their case. Freedom Debt Relief focuses mainly on providing debt settlement services. The company works through a team of experts that handle each case individually, and they have a proven record of success. If customers prefer debt consolidation, they can also find it though Freedom Debt Relief, which can connect potential customers with one of their trusted loan providers. The review of ClearOne Advantage shows how they also focus exclusively on providing debt settlement services. They offer counseling services as part of their settlement negotiation, but they do not work with other types of debt relief strategies. Accredited Debt Relief offers a comprehensive debt relief service. Starting with their consultations, the company can provide customers with more personalized solutions that include bankruptcy assistance, consolidation, settlement, and even credit counseling. They can offer these services through their network of trusted providers, which handle the specifics of each solution. WINNER: Once again, Accredited Debt Relief’s variety of service offerings puts them slightly ahead of their competitors. It should be noted that both ClearOne Advantage and Freedom Debt Relief offer outstanding settlement negotiation thanks to their laser focus within their field. When choosing a debt relief company, it is vital to choose a provider that will not cost more than the loan amounts that need to be paid. Additionally, it is important to find a service that offers a transparent fee structuring and can show results before asking for payment. ClearOne Advantage offers a success-based payment structure. The company does not charge anything for their initial consultations, or even for their negotiating services. ClearOne only collect a success-based fee from customers once a settlement has been reached and the initial payment has been made. Freedom Debt Relief's review discusses how they do not charge customers a fee until a debt is resolved, which is a refreshing change from other competitors within the industry. The company’s fees are included in customers’ debt payments. Accredited Debt Relief also offers a success-based model. The company does not charge any upfront fees and there are no hidden costs. They only collect their fees once debts have been successfully settled. WINNER: Freedom Debt Relief wins a narrow race, as their service lets customers avoid paying any extra fees until debts have been resolved, as opposed to when a settlement is reached. This gives customers more breathing room for debt repayment. 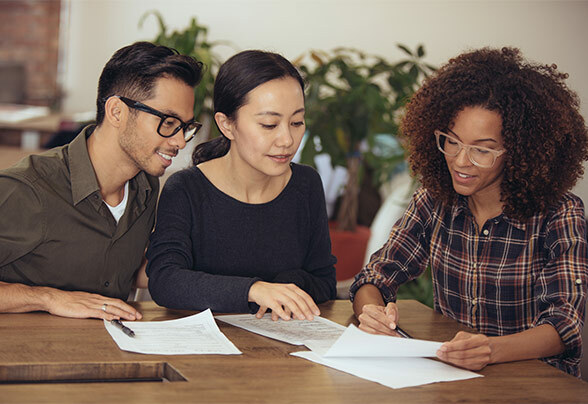 A major aspect of successfully exiting from burdensome debt is understanding its causes and what can be done to prevent it from happening again. As such, the best debt relief companies offer extensive educational resources that complement their traditional services. Freedom Debt Relief offers an excellent overview of the different strategies available for debt relief, including detailed descriptions as well as the benefits and negatives. They also host an insightful FAQ section dealing with common queries, as well as a nifty savings estimator. ClearOne Advantage provides customers with an impressive educational suite. The company maintains its own blog that features posts on current topics and personal finance issues, as well as a series of articles related to debt and a library of educational videos. Moreover, the company is set to unveil a webinar series for customers. Accredited Debt Relief delivers a breakdown of the different debt relief alternatives available. Additionally, they deliver a helpful FAQ section designed to answer more common questions. WINNER: ClearOne Advantage takes this category thanks to their diverse educational tools and their commitment to always providing more information. Getting out of debt is important, but escaping the financial hole in a timely fashion is crucial to avoid paying too much in interest and other related fees such as late penalties. As such, the goal for any debt relief service is to help customers lighten the debt load as quickly as possible. 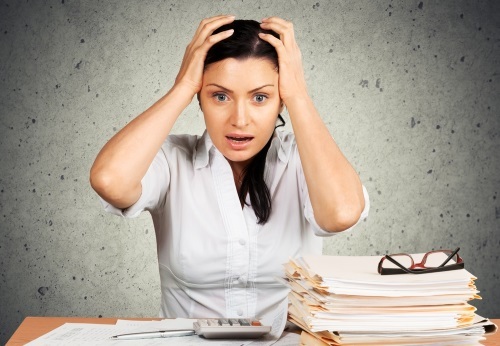 Accredited Debt Relief can help customers get out of debt in an average of 24 to 48 months. While results vary, most of the customers who report success with the company do so in less than 4 years. Freedom Debt Relief offers a similar time frame of 24 to 48 months. The company’s experts work closely with customers to help ensure the speediest possible results. ClearOne Advantage notes that most of its enrolled customers succeed in getting out of debt in 24 to 48 months, though results vary according to each person’s unique circumstances. WINNER: All three companies offer similar time frames for solvency, making this category a closely contested draw. When finding a debt relief provider, it is important to work with one that can ensure the best level of success, and is qualified to deal with a customer’s specific needs and requirements. As such, how they select their customers is important. Freedom Debt Relief works with customers that have very elevated debt levels. The company asks that applicants have at least $25,000 in aggregate debt, although they have few other prerequisites for admission into their relief programs. Accredited Debt Relief requests that applicants who wish to work with them have a minimum of $10,000 in debt. If this stipulation is met, the subsequent application process is incredibly involved, with representatives offering the best possible strategy for each customer. ClearOne Advantage looks for those customers that have a minimum of $10,000 in unsecured debt. The company’s application process helps determine whether customers are the right fit for their settlement negotiation programs. WINNER: Accredited Debt Relief takes the crown thanks to their more holistic approach to accepting applicants for their debt relief programs and partners. With 3 wins in 6 categories, the winner in this battle royale is Accredited Debt Relief. The company delivers an excellent variety of debt relief services, and their network of partners means that customers can always find a solution at reasonable fees. However, all three providers offer unique benefits, and can also help customers meet specific requirements depending on their preferences.